Kerr Pump & Supply is a stocking distributor for Busch Vacuum Pumps and Systems for the state of Michigan. Busch is one of the largest manufacturers of vacuum pumps, blowers and compressors in the world. 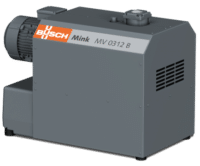 The Busch product range offers the largest selection of industrial vacuum pumps and industrial blowers available in the world today. Kerr relies on Busch’s 50 years of experience and expertise in vacuum system manufacturing to be able to offer our customers customized solutions for a variety of vacuum applications. Products are available with a variety of options and advanced design features, so customers get the most appropriate and cost-effective solutions. Kerr Pump & Supply can quickly ship your Busch Vacuum Pumps order or help you with vacuum pump rentals. These pumps are the industry standard due to their robustness and operational reliability in tough industrial applications. Safe and cost-effective, rotary vane vacuum pumps are known for their modern and energy-efficient vacuum generation. The rotary vane technology operates using a technically simple structure of the vacuum pumps. The consistently high vacuum level in continuous operation is provided through circulating oil lubrication, well-coordinated materials and state-of-the-art precise manufacturing. The standard oil separator ensures clean and oil-free exhaust due to its sophisticated extractor system with an integrated oil return. When fitted with an optional gas ballast valve, even large amounts of vapor can be processed. A non-return valve in the inlet flange prevents air from flowing back into the vacuum chamber when the vacuum pump is switched off. Highly efficient and ideally suited to industrial applications which require reliable and contaminant-free extraction of gases and vapors. Dry screw vacuum pumps operate with two screw rotors rotating in opposite directions. The pumping medium is trapped between the individual screw-shaped rotors, compressed and then transported to the gas discharge. During the compression process, the screw rotors do not come into contact with each other, or the cylinder. This means there is no need for lubrication or operating fluids in the compression chamber. Seco rotary vane vacuum pumps operate without oil using self-lubricating carbon vanes. They are ideally suited for applications requiring an oil-free operation. 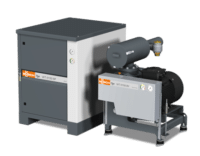 Seco rotary vane vacuum pumps stand out due to their low energy consumption. They are quiet and environmentally-friendly as a result of oil-free compression. The motor is ange-mounted directly to the pump, making it ideal for installation inside machinery. Robust design, lifetime-lubricated bearings and a surface-cooled motor provide a long service life for the pump. The rotary vane technology of Seco is also used for compressors. Seco SD compressors provide oil-free pressure generation up to 15 psig (optional). Extremely dependable, the constant differential pressure in both the vacuum and overpressure ranges is ensured at medium and high pumping speeds. Three-blade rotary blowers work according to the proven Roots system: two parallel mounted rotary lobes rotate in opposite directions within a housing. The pumped medium is sealed in the space between the rotors and housing. It is compressed, pumped through the housing to the gas discharge by the rotary motion and discharged. Available as single or two-stage pumps. Proven operating principle allows usage in critical applications such as evacuation of saturated gases and vapours. Liquid ring vacuum pumps normally operate with water as the operating medium. An eccentrically installed impeller rotates in the casing partly filled with liquid. By the rotational movement of the impeller and the resulting centrifugal force the liquid within the cylinder forms the so-called liquid ring. Gas is conveyed in the spaces between the single vanes and the liquid ring. Due to the eccentric installation of the impeller the spaces enlarge and the process gas is sucked in through the suction slot. As the impeller further rotates, the spaces are reduced, so that the gas is compressed and discharged through the discharge slot. The vacuum pump can be operated with water recirculation, open or closed loop circuit. Regenerative side channel blowers work according to the impulse principle. This means that kinetic energy from a rotating impeller is transferred to the pumping medium and converted into pressure. The impeller is mounted directly on the shaft of the motor and, together with the specially shaped housing, forms the side channel. The pumping medium is sucked in, compressed in the side channel and then discharged after one rotation. This allows a side channel blower to generate both vacuum and blast air. The motor power also influences the blower’s pumping or discharge speed. The two silencers located on the inlet and discharge sides provide quiet operation. 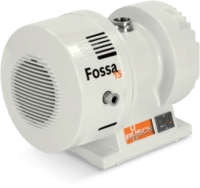 Hermetically sealed with completely dry compression, these pumps are ideal for pumping air or conveying gases without leakage. 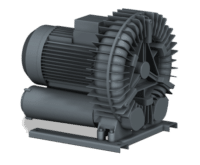 Scroll vacuum pumps consist of both a fixed and an orbiting scroll. As the orbiting scroll moves, voids are created at the inlet of the pump, drawing in the gas. As the rotor further moves, the gas is steadily compressed until it is discharged to atmosphere at the pump exhaust. Let the Kerr Sales Engineers design the right custom solution of Busch vacuum pumps & blowers for your particular application.